Hi, my name is Anthony Fasano. I am a licensed professional engineer, but instead of engineering I now spend my time inspiring engineers through different ventures and content channels. I worked for about 15 years as a civil engineer – primarily in land development but I also had exposure to structural engineering, geotechnical engineering, and environmental engineering early in my career. I even spent a few summers surveying, which was very helpful in the beginning of my career, and I highly recommend it to all young civil engineers. I realized at a young age that for civil engineers to be successful, technical competence wasn’t enough. Successful civil engineers that I knew had, in addition to their technical knowledge, the ability to communicate effectively, network and build relationships, and lead. I wanted to help more engineers do this, so I wrote a book for engineers, started a company and traveled to over 30 states speaking on these topics. During the last five years I have coached hundreds of civil engineers in career and professional development, so I’ve seen every problem or challenge you can imagine. This series will be focused at helping you develop these valuable skills as an engineer. Period. This series of articles will be different than others in that it will be very action-oriented and it will be based on my coaching experiences with engineers. Your time is valuable so if you are going to spend it reading, or commenting on my posts, I want you to be able to take the information, use it, and reap the benefits. To that end, here’s your first tip: Focus on the important things. Named after economist Vilfredo Pareto, the Pareto Principle, also known as the 80/20 Principle, states, essentially, that 20 percent of your efforts yields 80 percent of your results. So, what if you focused more on that 20 percent and less on everything else? For example, if you think a professional engineering license or master’s degree is going to make a monumental impact in your civil engineering career, then you need to put a lot of energy into achieving those things. Don’t get bogged down by other non-important things that won’t yield the same results. Understand that my goal in this series is to help you. I welcome any and all questions about career and personal development. 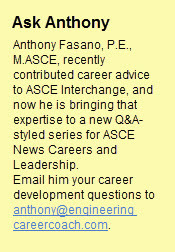 You can leave them in the comments below, or email anthony@engineeringcareercoach.com. 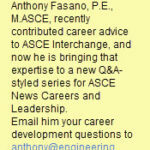 Anthony Fasano, P.E., M.ASCE, is the author of Engineer Your Own Success, co-host of The Civil Engineering Podcast and co-founder of The Seller-Doer Academy for Civil Engineers. 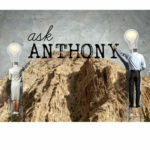 Ask Anthony: How Do I Follow Up With People I Meet At an Engineering Conference? 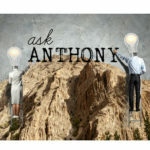 Ask Anthony: Should I Learn About Business Development as a Civil Engineer? I am from morocco. I am 25 years old & i prepare my Professional Master in Civil Engineering & Building. I would like to thank you so much for this video. These informations will help me to build my career. I’ll use them and reap the benefits.